Here is how to do this in both Firefox and Chrome. 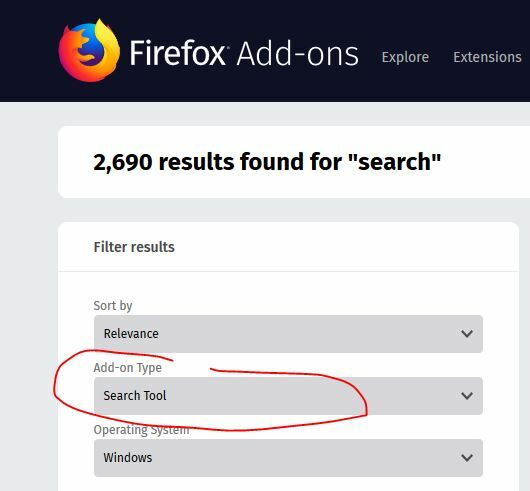 In Firefox install one of the “Search Tools“. For example, my favorite Thesaurus. 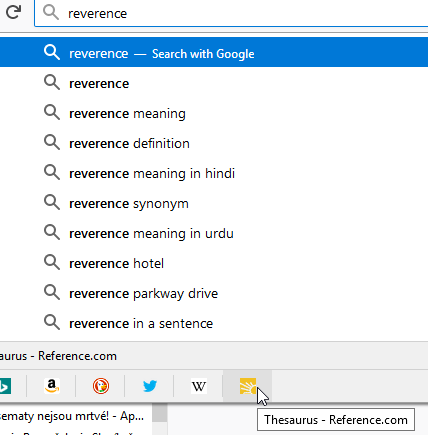 Now, after typing the desired phrase (here it’s “reverence”) click Thesaurus icon below and you will be taken directly to the site at https://www.thesaurus.com/browse/reverence. To search Google Drive install search tool Google Drive Files Search. 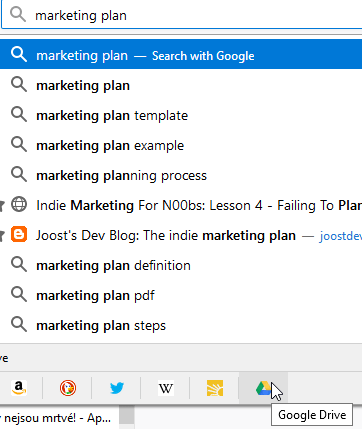 Type in what you wanna find (here it’s “marketing plan”), click the Google Drive icon below and your Google Drive will open directly at the results page https://drive.google.com/drive/search?q=marketing%20plan. 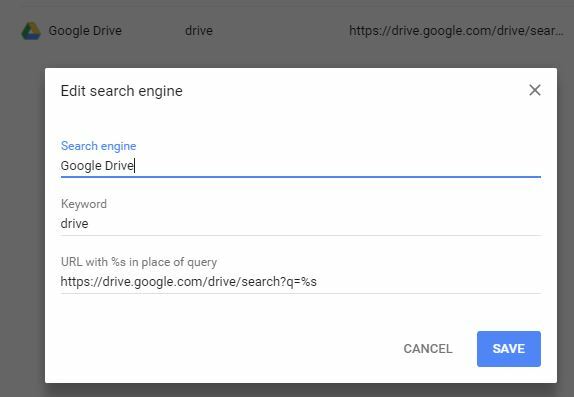 No more waiting for Google Drive to load before you can start searching! Straight to the results! Hey, but what if you don’t find “Search Tool” for your desired website?! There is still a chance! You can try checking Mycroft Project. 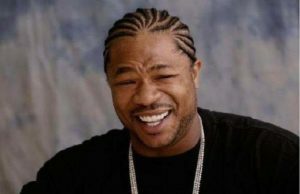 If you wanna go the “Yo dawg” way, you can install Mycroft Project search tool. Are you requiring to search something a bit more obscure? Create your own search tool! Or here. In Chrome, things are slightly different. 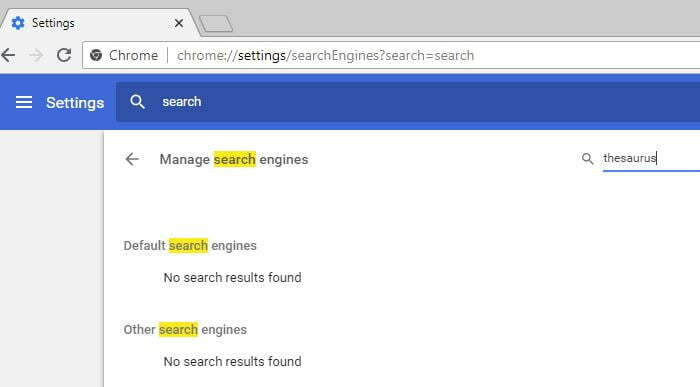 Chrome automatically stores encountered “search engines”. Look them up in your settings – just search “search” (yo dawg). What we are interested in is the keyword column. How does it work? Type specific keyword in your address bar, hit Tab, then type in searched phrase and hit Enter. This will search directly in the search engine specified by the keyword. 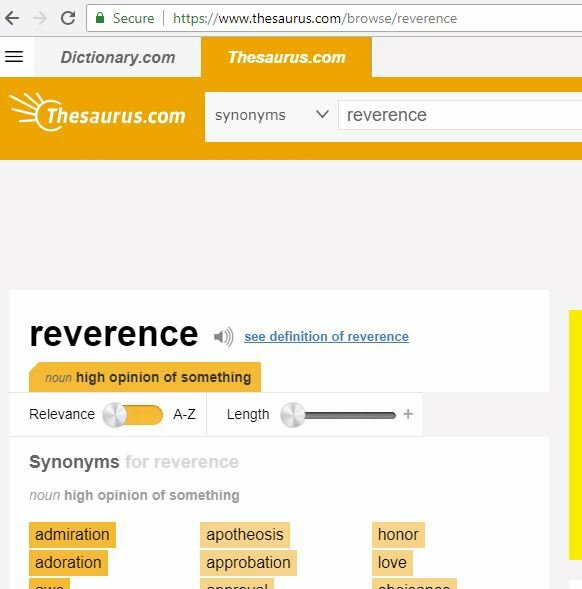 What about my favorite Thesaurus? I don’t have it among my search engines! 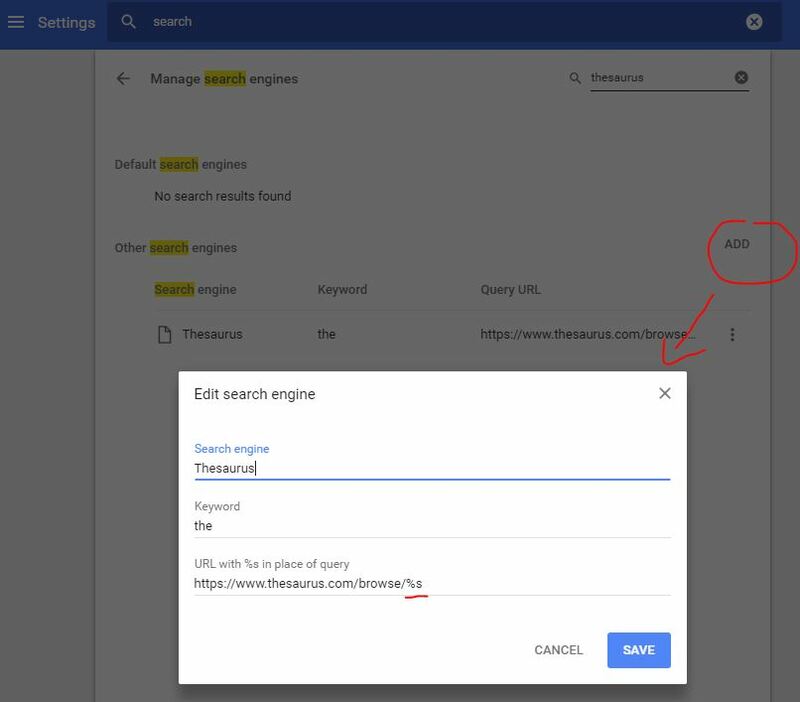 How can I add my own search engine? Let’s visit the website thesaurus.com. So let’s create a new search engine with exactly that. Copy the link, click ADD in search engines, put in the name, keyword for search and paste the thesaurus link. Replace something with %s. It will get replaced with whatever you are searching for. To search, let’s enter the keyword “the” into an address bar, press Tab, enter the desired phrase and hit Enter. This will take you directly to the results. Want to search Google Drive? Do the same thing. 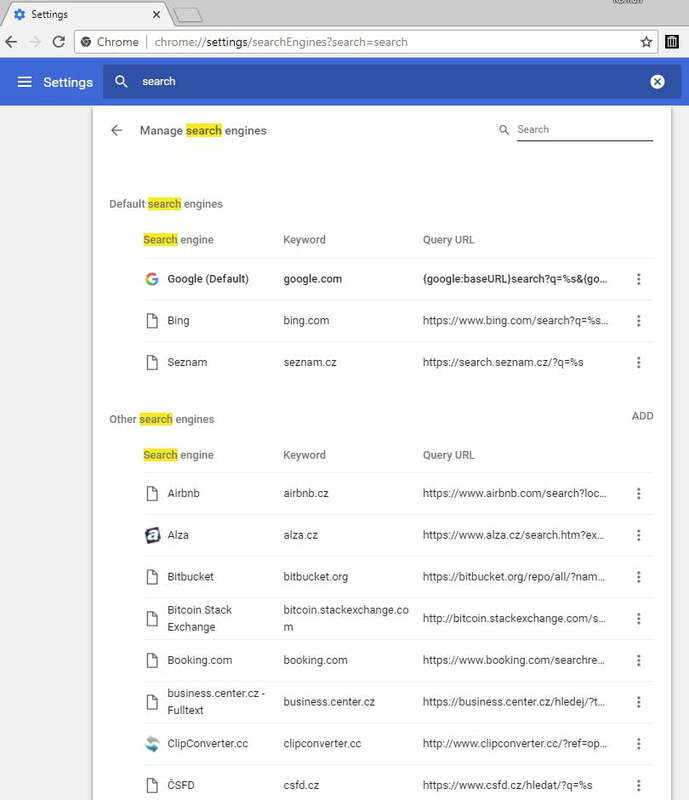 Try search for “something” on Google Drive. Add a new search engine, choose your keyword, copy/paste the link and replace something with %s. In the next article I will show you How to Search Only the Specific Google Drive Documents from the Address Bar. 1 Pings/Trackbacks for "How to Search Your Favorite Websites and Google Drive Directly from Address Bar in Both Firefox and Chrome"